"The details of who did what to precipitate Russia’s war against Georgia are not very important. Do you recall the precise details of the Sudeten Crisis that led to Nazi Germany’s invasion of Czechoslovakia? Of course not, because that morally ambiguous dispute is rightly remembered as a minor part of a much bigger drama." Kagan’s take has implicitly been widely accepted in policy-making circles and official declarations: attribution of responsibility for the August 2008 war has largely rested with pre-conceived notions about the sides, rather than on the detailed and nuanced reports of the EU-sponsored fact-finding mission . If we agree with Kagan, this is the way it should be, and no fact-finding mission was actually needed in the first place. This view can be ascribed to thin geopolitics, which, as argued in Toal’s book, is based on moral dichotomisation: “empire versus freedom, democracy versus authoritarianism, Russia versus the West”. As they facilitate the establishment of coherent narratives, such simplified framings by and large shape the public’s opinion, the mainstream conversation around developments in the post-Soviet space, including about matters as different as the conflict in eastern Ukraine or political contestation in Moldova. But what if, instead, we believe that the details matter, that we should acknowledge the “messy heterogeneity of the world”, that “local conditions matter, that agency is rarely singular, that power is exercised geographically” (some of the attributes of thick geopolitics)? The resulting picture would likely be unacceptably complex for mainstream media framings. In particular, in a context such as that of Abkhazia and South Ossetia where grand bargains and comprehensive peace agreements are difficult to imagine, complexity and details are absolutely necessary for developing a human-rights-based approach for enhancing the lives of people whose lives have been disrupted by conflict. Reducing the impact of de facto borders by facilitating the transit of goods and people across them would certainly be an important step in the right direction. After the conflict in the early 1990s, South Ossetia has long been a place of transit, and areas controlled by de facto authorities in Tskhinvali were easy to access. 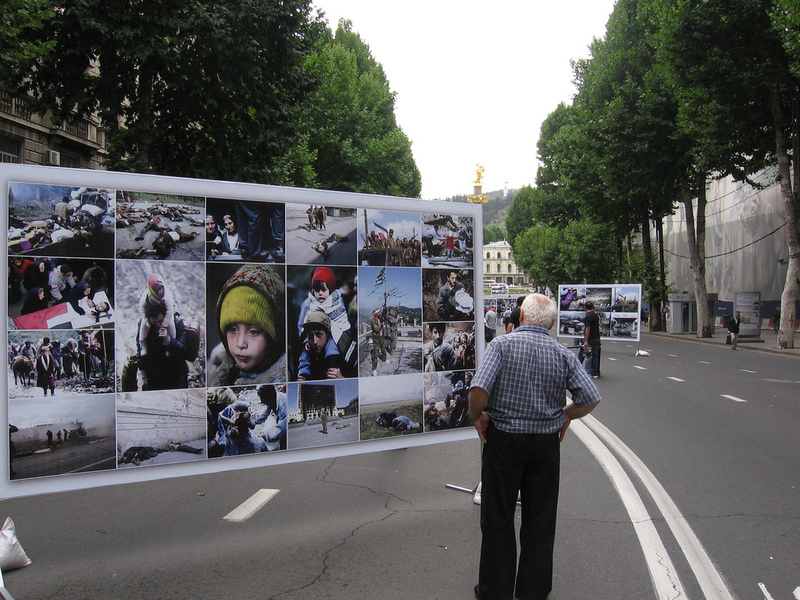 This changed abruptly after 2008 when new policies and the physical fencing of the border made South Ossetia largely inaccessible from Georgia, except for a few residents. As highlighted in a recent Crisis Group report, however, the border is not actually sealed, and substantial trade has been taking place across the dividing line. Indeed, starting in January 2018 , authorities in South Ossetia have introduced legislation allowing for imports from Georgia and have started collecting custom duties. Opening a transit corridor through South Ossetia is now a distinct possibility discussed by all sides involved, and some technical aspects have already been resolved (both Russia and Georgia have signed a contract with the Swiss company SGS to monitor trade on the route). In the case of Abkhazia, as outlined in detail in a number of reports , trade across the Inguri has continued to take place through these years, even if it has never been formalised. The time has come to regulate it . Regulating trade across conflict divides may well play only a limited role in the peace-building process , but it has fundamental positive externalities. Firstly, it will likely enhance the livelihoods of people living across the conflict divide, potentially reducing corruption and facilitating formal transit across the de facto border not only for goods but also for people (at least for short-term visits). Secondly, it pushes all sides to acknowledge and discuss normative acts in Abkhazia and South Ossetia that, even if their implementation is often uneven, have an impact on the life of residents. Well beyond trade, this is crucial for supporting efforts aimed at protecting and promoting human rights in de facto states, and should not be dismissed on the basis that international actors do “not recognise the constitutional and legal framework” of de facto states (a phrasing used in EU statements, e.g. in occasion of elections in these territories ). In this context, it is worth highlighting that reference to the legal framework of Abkhazia and South Ossetia even by state officials does not imply their recognition. In fact, given that intent is a crucial component of international recognition, fears of inadvertently recognising a de facto state are misplaced: accidental recognition is impossible both in theory and in practice. Trade regulation is however not the only sector that calls for pragmatic engagement. As I have previously argued in the case of Transnistria, independent and in-depth human rights reports include a detailed list of aspects that can be approached pragmatically and can serve as the basis for enhanced engagement and cooperation by the European Union and other actors with these territories. An authoritative human rights report on Abkhazia was published in 2017, and should serve as a starting point for approaching some urgent problems, including – but not limited to – issues such as freedom of movement and the language of education that can largely be addressed even without a comprehensive peace deal. Given the prominence of Russia’s assistance, there is limited scope for conditionality , but still substantial room for engagement. The speed of the dramatic events of August 2008 left little room for nuance and ultimately pushed many to interpret what was happening through the lens of preconceived understandings of the motivations and goals of the actors involved. Ten years after that war, embracing complexity, acknowledging local agency, and working towards pragmatic and humane solutions is the way forward for peace and welfare in the South Caucasus and elsewhere in the post-Soviet space.